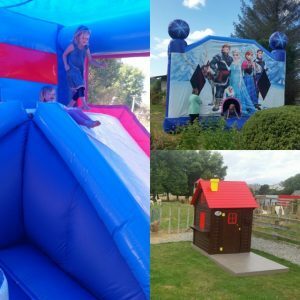 This is more than just a café, as Flat Hills is also home to friendly animals that can be fed, bouncy castles, a maze and a small playground area (although the equipment is probably better suited to kids up to about 5 years). There’s also lots of space for kids to run around, including some undercover if the weather isn’t great. There’s also a small play area inside. The cafe itself is child friendly serving counter food and a reasonably full menu of standard fare (breakfasts, burgers, hot and cold sandwiches and hot meals). There’s also a kids’ menu, highchairs and a change table (in the disabled toilet). Flat Hills comes highly recommended as a great place to stop on SH1 by the Kids on Board Facebook community, especially for people looking to break a journey approximately halfway between Taupo and Wellington (it’s about 20km south of Taihape). The only problem being getting the kids back in the car to carry on your journey. Address: 5733, State Highway 1, Ohingaiti, Rangitikei. Plenty of parking. If heading north, Flat Hills is on the left about 5km after the small township of Ohingaiti. If heading south, it’s on the right, 6.5km after the township of Mangaweka.